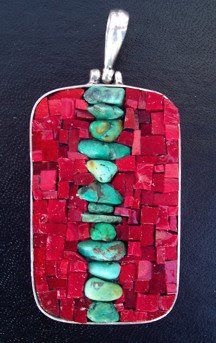 Margo Anton's Mosaic a Day: "Turquoise and Red"
I love the color combination of turquoise and red. At first I wasn't sure how it would work in a single piece of jewelry, but I really like the effect. What's funny is I went in the studio to do something in a chartreuse green, and this is what happened. About as far as you can get from green. This is another piece that is a bit more expensive than usual owing to the sterling silver base. A number of people have been asking where I get my bases. I get them from Tiles and Tools in the Netherlands. The website is listed under my suppliers list towards the bottom of the blog page.